If you're one of those people who's always wondering why the flying car hasn't been invented yet, you're too late. 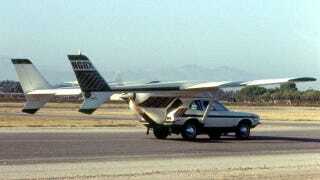 The first flying car was already created back in the 1970s — but don't get too excited. It was literally a huge disaster. Over the last year, scientists have been trying to perfect a real flying car — which is for the best, since an imperfect car has caused a lot of trouble in the past. Henry Smolinski was the inventor of the first flying car — and it killed him. But it was a beautiful dream while it lasted. Henry Smolinski and his partner, Hal Blake, founded Advanced Vehicle Engineers in 1971, expressly to design and build a flying car. Their one and only product was the AVE Mizar — and it wasn't a design that allowed you to take to the air if you hit a traffic jam on the highway.Instead, it was a simply a car that a person could attach wings to, fly up into the air at a local airport, come down a few hundred miles away at another airport, stick the wings in the trunk, and head out down the road. The prototypes of the car were made by sawing up a Cessna Skymaster airplane and a Ford Pinto, and putting them together. The controls were adapted so that they drove the car on the ground and the plane in the air. The fact that they managed it at all was an impressive feat, and even though the engine failed on their first flight, they landed the Mizar and drove it back to the airport. The combination of imagination, determination, and bravado was a hit — and in early 1973, the Mizar was considered to be the new automotive sensation. It wasn't until late 1973 that Smolinski and Blake discovered there was a problem with a plane whose wings were designed to come off. The pair were going down the driveway on a routine flight of the Mizar, when the Cessna wings detached from the car. This left the two inventors in mid-air in a Pinto. The two inventors were killed, and the idea was completely scrapped. The idea that today there could be Pintos swooping and turning over our heads like combustible pterodactyls is both wonderful and terrible. While hindsight is twenty-twenty, it is, perhaps, understandable to allow a moment of silence not just for the two men that died, but for the kooky idea that died with them. Via American Way Magazine and Doomed Engineers.